A trio of recent hi-def horrors reviewed. The 1980s was a golden age for horror comedy, but for all the classics - An American Werewolf in London, Night of the Creeps, Evil Dead 2 - the decade gave us plenty of duds too, movies that failed to elicit either laughs or scares. 1985's Fright Night is one such example. It boasts what should be a winning setup - awkward teen enlists the aid of an aging horror host to battle the vampire who moved in next door - but the elements never quite gel. Yet, like other '80s mediocrities The Goonies and The Lost Boys, it boasts a cult following today. As the vampire and the horror host, Chris Sarandon and Roddy McDowell lend a touch of class to a movie that otherwise would likely remain on the VHS pile of forgotten '80s horror. Fright Night's trouble comes with its teen characters. William Ragsdale simply doesn't possess the charisma required to carry the lead role (picture Michael J Fox in this part and the film suddenly comes to life); Amanda Bearse never quite makes the most of his more mature girlfriend; while Stephen Geoffreys is downright irritating as his obnoxious best friend (his Evil Ed seems to have inspired Matthew Lillard's equally abrasive Scream character). Fright Night's main strengths are its visuals, with atmospheric cinematography from Jan Kiesser, and its practical effects courtesy of Richard Edlund, fresh off the previous year's Ghostbusters. Eureka's 4K restored blu-ray is a fine showcase for both. 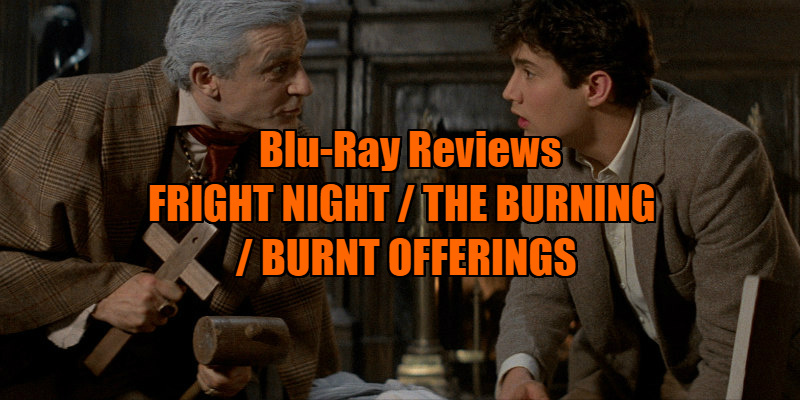 The cult appeal of Fright Night means Eureka have stuffed their blu to the gills with meaty extras. You’re So Cool, Brewster! is a new two hour documentary on the making of the film, while there are also substantial featurettes on the cast and crew, along with trailers and a look at director Tom Holland's collection of stills and memorabilia from the film. The steelbook edition comes with a booklet too. A definitive package that makes me wish I was one of the film's many fans! Fright Night is available from Eureka in a Limited Edition Dual-Format SteelBook now, with a Special Dual-Format Edition available from April 10th. One of two early '80s slashers to riff on the upstate New York legend of 'Cropsey' (the other being 1982's inferior Madman), The Burning arrived in 1981 at the peak of the slasher era. Cropsey here is a summer camp janitor who almost burns alive when a prank by a bunch of campers goes horribly wrong. Five years later he leaves hospital and heads for the summer camp, determined to spill the blood of any campers he finds. The Burning is now best known for featuring some big names pre-stardom. The cast includes fresh-faced versions of Jason Alexander, Fisher Stevens and Holly Hunter, while it was produced by Harvey Weinstein and co-written by his brother Bob, who released the film as the debut of their Miramax Films. The production also attracted some considerable established talent in the form of prog-rocker Rick Wakeman, who added a very 1981 synth score, and make-up maven Tom Savini, hot off the previous year's gorefest Maniac. It's the latter who arguably makes the most significant contribution, as without his outstanding practical effects the movie would be simply another Friday the 13th knockoff. The film's most revered sequence shows Savini at his best, an outrageously violent attack on a bunch of teens on a raft that results in hacked off fingers and punctured thoraxes, edited with precision by future Nightmare on Elm Street 2 director Jack Sholder. As summer camp slashers go, The Burning rests at the higher end of the spectrum, a huge improvement on the tedium of Friday the 13th but lacking the WTF? appeal of the sub-genre's finest achievement, 1983's Sleepaway Camp. Slasher buffs are advised to add Arrow's blu to their collection. No less than three audio commentaries, from director Tony Maylam and critic Alan Jones, stars Shelley Bruce and Bonnie Deroski, and podcasters The Hysteria Continues; interviews with actors Lou David and Leah Ayres, Rick Wakeman and Tom Savini; behind the scenes footage; image gallery; trailer. 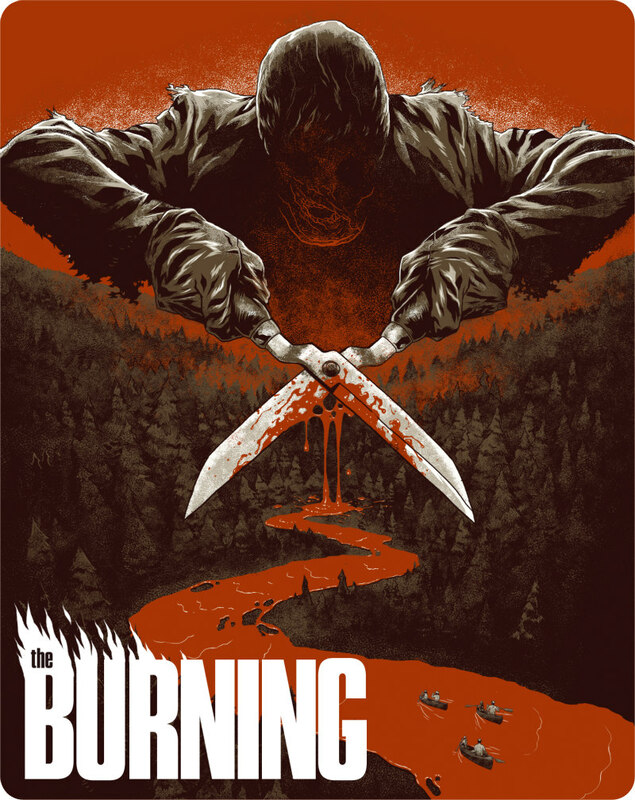 The Burning is available on blu-ray from Arrow Video now. Dan Curtis was the master of American TV horror throughout the '70s. Having created the cult horror themed soap opera Dark Shadows in the late '60s, he went on to write, direct and produce some of the most memorable TV movies of the following decade (Dracula with Jack Palance as the count; Trilogy of Terror with Karen Black famously menaced by a possessed African doll; Scream of the Wolf with Peter Graves battling a lycanthrope) along with the great monster of the week series The Night Stalker, acknowledged as the primary influence on The X-Files. Curtis made great TV, but when he turned his talents to the big screen with this adaptation of Robert Marasco's 1973 novel, he was found somewhat wanting. Burnt Offerings looks very much like a TV movie of the week, with Curtis offering bland staging and uninspired visuals in a mostly hum-drum haunted house tale. The cast elevates the material to a large degree however, and while Curtis is no visual stylist, he sure knows how to mine a solid performance from his leads. With Burnt Offerings he had the unenviable task of working with Oliver Reed, Karen Black and Bette Davis, a trio of stars notoriously difficult to work with, but all do great work here. The Shining's Jack Torrance owes much to Reed's character here, an initially laid back patriarch who grows increasingly unhinged, but unlike Jack Nicholson, Reed successfully portrays the arc, and he appears sober throughout, despite anecdotes to the contrary on the disc's extras. Having become known for portraying crazy old bats in her later life, Davis was cast against type as a friendly old aunt here, and she plays it with all the charm of her youth. Burnt Offerings adds little of note to the haunted house genre, save for a few touches that seem to have inspired later films, such as the silver streak that appears in Black's hair after a traumatic moment (see also Poltergeist and A Nightmare on Elm Street), and Stephen King acknowledges Marasco's novel as a major influence on The Shining. But it's the trio of central performances from three very different actors that holds the viewer's attention, if not its uninspired plot beats. Commentary by film historian Richard Harland Smith; interviews with actors Anthony James and Lee Montgomery, and screenwriter William F. Nolan; an animated gallery of promotional materials and behind-the-scenes stills; trailer. Burnt Offerings is available on blu-ray from Arrow Video now.